This 17th Century, Grade II listed Bed & Breakfast Accommodation is set in a quiet street, steeped in historical and architectural interest, at the heart of the glorious Isle of Wight's capital town of Newport, with all its facilities to hand. Martin and Suki welcome you to their family run business which is open all year. 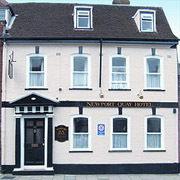 There are 12 warm and comfortable en suite rooms, with ground floor, family and four poster rooms available. We have singles, doubles and triples to choose from. All rooms are Non-Smoking, have flat screen televisions with Freeview; tea and coffee making facilities; direct dial telephones; radio alarm clocks and hairdryers. Free internet access with accommodation-wide Wi-Fi plus higher download rates available at a small extra cost. As well as our comfortable accommodation, you can relax in our restful lounge, with its original Victorian wood panelled walls, exposed beams and its impressive fireplace. We have a small rear courtyard which catches the sun and is a pleasant place to enjoy a drink in the evening. A substantial English Breakfast using fresh local produce, where available, is cooked to order, and served in the separate dining room with its beautiful Italian marble fireplace. Most town roads and country trails lead from Newport, making the Newport Quay an ideal base for your stay, whether it is for business, pleasure, walking, cycling or driving. There is Pay and Display parking immediately in front of the hotel (free from 1800-0800) and a Long Stay car park 150 metres away that costs approximately £6 per 24 hour stay. Once the home of Newport’s butter market, this historic Isle of Wight building provides superb central access to the whole of the Isle of Wight and is within easy reach of the major ferry ports, Cowes, Fishbourne and Yarmouth.